www.searchingforreason.net : Special opportunity: Join our Electoral Volunteer Corps. Special opportunity: Join our Electoral Volunteer Corps. For nearly two years, we have weathered the Trump-Pence administration’s political attacks on our health and rights. But these same attacks have also spurred a groundswell of opposition from people who are fighting for a world where everyone has the freedom and opportunity to control their own lives. For the first time since Trump took office, we have an opportunity to reject his dangerous agenda up and down the ballot. Here in Massachusetts, we have endorsed a slate of candidates for the Massachusetts State House who will prioritize access to sexual and reproductive health care and defend the health, rights, and freedoms of all Massachusetts residents. By electing and reelecting these leaders, we will be able to advance a bold legislative agenda in our state and protect ourselves from the Trump-Pence administration. But these races are close, and we need your help to win. Apply today for our Electoral Volunteer Corps to help elect bold leaders across Massachusetts. The Electoral Volunteer Corps is a leadership and training program for Planned Parenthood Advocacy Fund supporters and volunteers. To join, you must be able to devote four hours per week for canvassing, phone banking, training, and other opportunities where you will represent our movement in some of 2018's most competitive local races. The program will kick off officially on Sunday, September 9th. 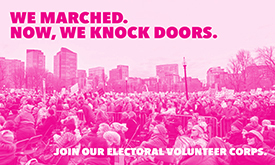 YOU can help defeat Planned Parenthood opponents – join the Electoral Volunteer Corps. 2018 is our moment. After months of marching, it’s time we take up our clipboards and knock some doors. Join me in the fight for a healthier, more equitable future. P.S. Want to learn more about the candidates we are supporting this year? Check out our endorsements here and share them with your friends and neighbors.